Robotics is evolving fast to keep pace with new methods of production. With supply chains shrinking and just-in-time production even more the norm, industries are looking to invest in robotics that can handle a wide variety of tasks. The flexibility required for short production runs is one of the main inspirations behind the HelMo mobile robot system. All over the world, mobile robots are poised to play a bigger and bigger role. Spot automation of multiple tasks allows industries to avoid investing exclusively in stand-alone applications or non-cost-effective automation processes. Users of a mobile robot system like HelMo can choose the tasks the robot will perform in response to immediate needs. In doing so, they gain more control over ROI and production quality by reducing batch output requirements and transfer time between processes. The HelMo mobile robot system by Stäubli is designed to serve as a production assistant that can deploy where and when it’s needed. The mobile system can rapidly navigate between processes in a small batch production environment. 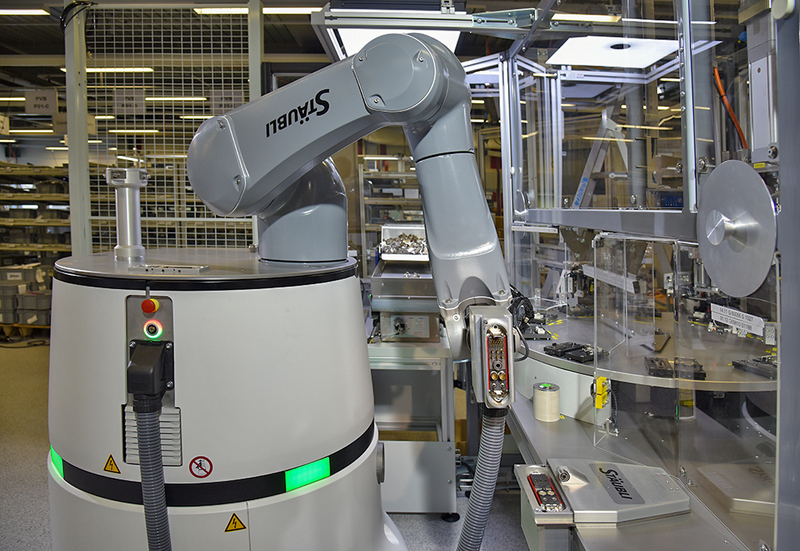 By collecting components or peripherals required for automation and moving them from point to point, it boosts the availability of hybrid assembly lines and increases their ROI. And because it’s so versatile, the system can handle virtually any manual task on a production line. It can step in “at the drop of a hat” to replace an operator who calls in sick or take care of tedious repetitive tasks, working night shift after night shift without tiring or making mistakes. HelMo can resolve a variety of common issues: it helps prevent unscheduled production stoppages and enables manufacturers to keep up with demand during peak periods by optimizing delivery capacity. 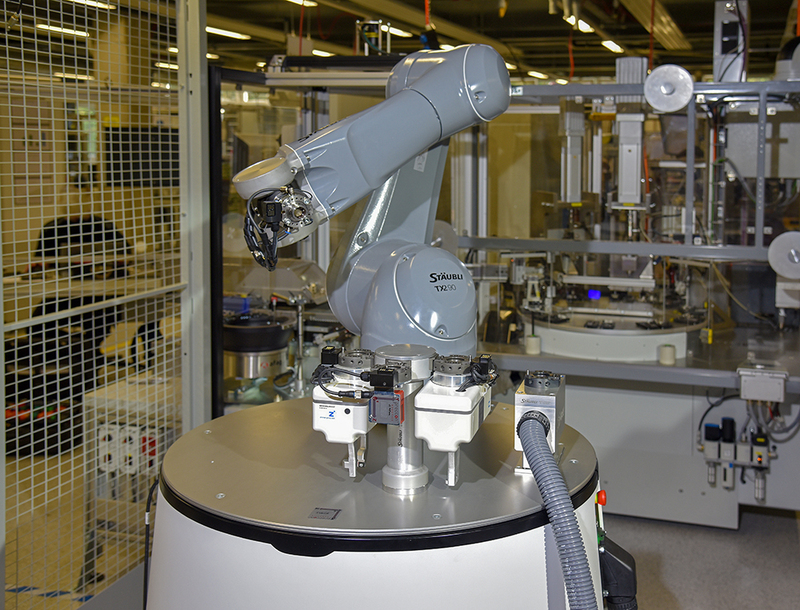 HelMo is based on the Stäubli six-axis TX2-90 (L or XL) collaborative robot, which has a carrying capacity of up to 20 kg and a range of 1450 mm. It’s equipped with a rotating base for enhanced flexibility, a sophisticated safety package, and a drive unit with built-in batteries and a compressed air tank to ensure autonomy during movement or prior to charging. HelMo navigates safely and securely using three built-in laser scanners that permanently monitor its surroundings, allowing for precision navigation and keeping the people it encounters safe. HelMo is the ideal answer to the call for “Automation whenever and wherever needed,” performing tasks automatically or in collaboration with people. The moment the robot arrives at a workstation, it positions itself precisely to within a tenth of a millimeter, calibrating its position via three permanently installed measuring points. It then connects to fixed power and compressed air supplies and a data-sharing connection via two types of Stäubli multi-connectors (flexible or rigid). HelMo can be used in virtually any area of operation, from procurement and logistics to handling, assembly, machining and quality control. Not only does it boost production flexibility, it delivers consistent quality and allows employees to focus on value-added tasks.